LANCASTER – SGT, Joseph P. Collette, age 29, of Fountain, CO born and raised in Lancaster, OH died serving his country in Afghanistan on March 21st, 2019. He graduated from Lancaster High School in 2007 and enlisted in the U.S. Army for 8 years 4 months where he was an EOD technician.. 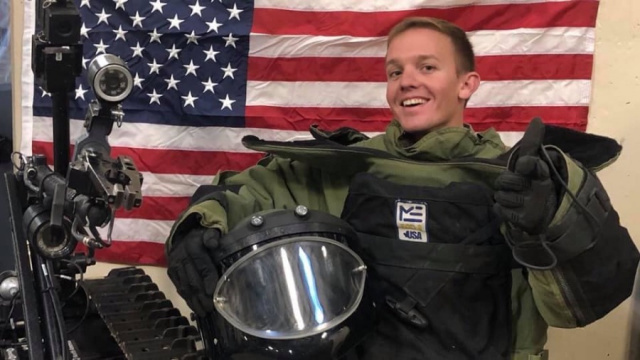 He was in 242nd Ordnance Battalion, 62nd Ordnance Company, 71st Ordnance Group stationed at Fort Carson in Colorado Springs, CO. Joseph enjoyed running, snowboarding, Pokémon, gaming, and 4-wheeling. He almost went professional in paintball. He had a passion for cooking and loved spending time with his family and friends. All who knew Joseph will greatly miss his amazing personality, sense of humor, and his love for life. Joseph is survived by his perfect soul mate and wife, Caela Collette; children, Blair and Cody Collette; step-children, Lena and Aria Scott; devoted mother, Theresa (Dan Fuller) Mecionis; father, Joseph A. (Cindy) Collette; step-father, Jim (Rosi Flores) Wickline; siblings, Anthony Vincent Colletti, Camille Marina Colletti, and Nicholas Joseph Colletti; grandparents, Joan Mecionis, Barbara (Rick) Ramsey, Shirley Wickline, and Mary Jo McConnille Lynch; aunts, Ronnie Iannacchino, Dr. Michele Lynch, Jill (Mark) Lynch, Danielle Collette; uncles, Bobby (Irene) Mecionis, David (Denise) Mecionis, Ray Collette, Keith Collette, and Eric (Ann) Lynch; cousins, nieces, nephews, and close friends too numerous to mention. He was preceded in death by his grandparents, Jere and Joseph Collette; Peter Mecionis, and Howard Lynch. “This is F. Eric Smith from the Frank E. Smith funeral home and I have received confirmation as of 3:30 p.m. this afternoon that SGT Joseph Collette will be arriving Wednesday at Rickenbacker air Force Base, at 9:40 a.m. Wednesday April 3rd. Those of you attending the procession at the Rickenbacker airport please meet a half hour before arrival at 9:10AM at Rickenbacker Airport to form a procession to commence shortly after his arrival. We will go at a leisurely pace down 33 to Lancaster 33 business route, to a left onto Main Street , a left onto broad, a left onto Wheeling, and a right onto Columbus Street where the hearse will stop in front of the funeral home where the honor guard will then end the procesion with Joseph being taken into the funeral home. Those of you who wish to honor Joseph this Wednesday morning and line the streets may do so downtown Lancaster near the gazebo on Broad and Main St and also down Wheeling towards Columbus St. as the procession will pass by from Main Street.